After having spent years working with teams by email, tedious meetings and Excel spreadsheets, we started to think a few years ago about a different way of working. Those experiences gave birth to Azendoo, our collaborative work app. But more than a simple app, Azendoo brings forward values that match tomorrow’s working world: agility, transparency, well-being, productivity. Faced with the new challenges of the world, we resolutely believe in the strength of teamwork, when it’s properly organized. Work, its organization, its constraints, this all became our profession. So here I wanted to share with you a few simple practices that you can apply in 2018 to be in sync with your ways of working. Before being a team member, you’re a single worker who is trying to maximize your value on a daily basis. To exist well with others, you first have to exist well with yourself. That goes through a sense of accomplishment in one’s work. It’s not something that’s defined. It’s a series of small steps, attempts and errors, where a bit of distance becomes necessary. Learning to better know oneself is, for example, knowing how to dispense one’s energy: am I a morning person or an evening person; am I productive on the weekends; how many evenings per week can I work; am I effective when I have 5 business lunches and 4 business dinners during the week; am I ok not reading for pleasure or listening to the radio? Asking these questions lets you better organize yourself and put in place routines that generate more free time. For me, it’s: Monday afternoon, homework with the kids; Wednesday afternoon, yoga; Friday afternoon, administrative work (since I can’t really do anything else at that point); every weekend, sports; inbox 0 on Tuesdays and Fridays. 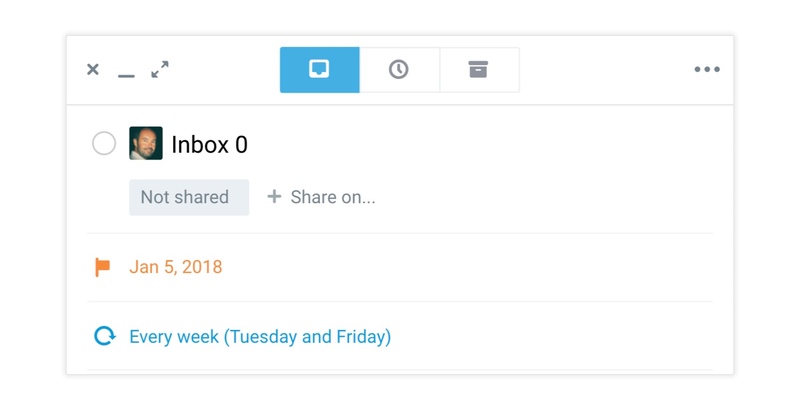 These routines are set with my calendar and with Azendoo: for example with the repeated task “Inbox 0” every Tuesday and Friday, all administrative tasks systematically set for Friday afternoon, when I give myself the challenge of finishing as much as possible before leaving for the weekend. Without turning this into too much on personal development, here are a few other tips to try at the beginning of the year: try to identify what slows you down, don’t take too much time to respond to a message, starting a task lets you understand its size, ask for help if you need it, accept weaknesses that you can’t change, free your time by learning to say no, move forward slowly but steadily, don’t be (too) sensitive (that one’s for me ;-). The goal is to succeed in your work, and succeeding in your work lets you enjoy it, finding a real meaning in what you’re doing over the long term. Transmitting that kind of energy and determination to your team is the best way to move forward. With the development of new professions, expertise is being multiplied and teamwork and collaboration among experts and cultures is becoming even more important to properly guide a business. It’s a well-worn subject, but it’s still the reality for many employees. It’s enough to take a train between Paris and Bordeaux to see that Outlook is still holding thousands of unread emails, out of control and requiring hours of responses and attempts at organizing. For many people, work is just an uninterrupted flow of incoming mail, broken up by inefficient and overly-long meetings. Personal reflection, taking a bit of distance, searching for fresh solutions occupy a very small part of their time. Emails contribute to overheated and disorganized teams. 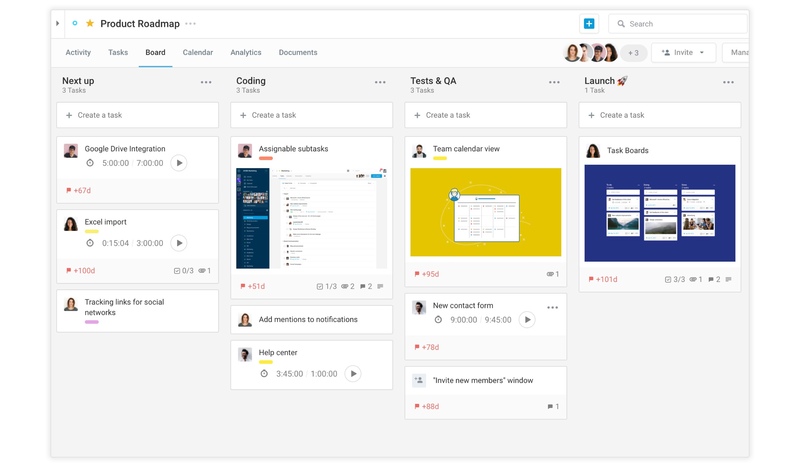 A solution like Azendoo lets you separate that which is linked to actions (organizing work) and that which is linked to content (ideas, problems, information). Shared action plans allow teams to better understand their objectives, their deliverables, the schedule and how to collaborate. Sharing and transparency create serendipity within the organization, creating value and safety nets. Even with Azendoo, email remains as a daily tool to stay connected with the outside world: with prospects, partners, candidates. Our app offers numerous possibilities for email integration. 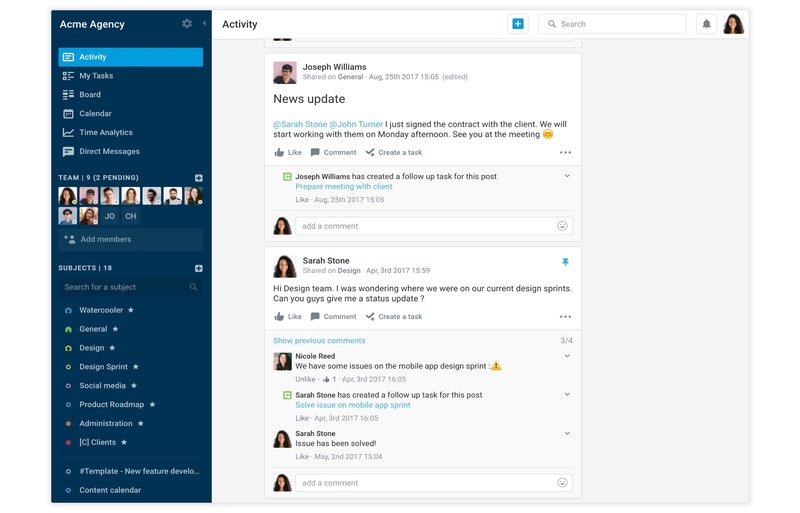 On average, thanks to a new way of structuring work communications, Azendoo’s users see a 70% reduction in their emails. Meetings are another big source of a team’s lack of productivity. Meetings are usually too long, with too many people, and without clear objectives and/or conclusions and action plans once they’ve ended. In a world that’s evermore complex, and notwithstanding all the possible messaging systems, direct conversations should be used to really move forward on the problems that need to be resolved. Exchanging quick, short messages isn’t enough. It’s by bringing together multiple areas of expertise or points of view that lets a team find solid solutions. Before having these discussions, each person should work on the question alone, to be able to develop an opinion and sketch out a few ideas. Brainstorming without preparation doesn’t produce quality results. Meetings thus often require work beforehand, getting to the bottom of things in order to offer viable solutions. For our internal meetings at Azendoo, it’s a maximum of 4 people, for a maximum of 45 minutes, whether in person or not (thanks to Cisco’s Sparkboard). These meetings are always on an identified and precise subject (product, development, marketing, business…). It is a synthesis of schemas or documents shared instantly through the right item or subject in Azendoo, and it’s a live update on the action plan for the tasks at hand (with or without a deadline) in Azendoo. Beyond these punctual meetings that are organized as time goes by in order to advance on certain projects, we’ve also set up 2 regular meetings with the whole team (across 3 sites) on Mondays and Fridays, in the early afternoon (to balance different time zones). These meetings let everyone take 3 minutes to present what they’re working on for the week and the numbers from the previous week (on Mondays) and what they did during the week and any difficulties they encountered (on Fridays). One other problem that pushed us to create Azendoo was the over-managing of projects within companies. The problem of project management is that there’s usually more management than project. Over-managing is a plague closely related to bureaucracy. It creates work without creating value. Over-managing will usually result in a loss of productivity, an increase in stress levels as employees face down continuous reporting and update meetings, and never has a positive impact on team spirit. I’ve seen huge IT projects where management costs were 30% of the total budget, and all that in order to deliver late while costing way more than the original budget. It’s the double penalty of a “well-managed” project. We developed Azendoo to free up more effective work time, with a team-based discipline rather than project management. From its roots, Azendoo consolidates and updates the advancing state of a project without needing to organize special meetings just for that. Management time is re-allocated to project time, helping the project come to fruition with maximum levels of quality and impact. Good luck on your resolutions, and a happy new work year to all!